We are saddened by the loss of the great Richie Havens but feel so fortunate to have spent this time with him and have this special podcast to share. A genuine artist with a generous spirit that will forever live on in our hearts through his music. Peace, love and gratitude, Richie. You will be missed. 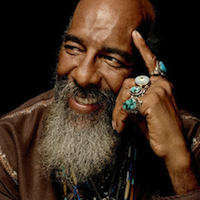 Richie Havens has been telling timeless stories through song for over 40 years. Ever since he captivated the crowd at Woodstock, he‘s been writing, recording and moving audiences throughout the world with his distinctive voice. We recently sat down with the shaman to chat about his unique approach to life and music. Warm, funny and endlessly engaging, Richie Havens is keeping it real in this boomitude original podcast.